TORONTO — The champagne bottles spelling out TFC on the floor of the Toronto FC locker-room told the story. As did the big bin of empty beer cans. 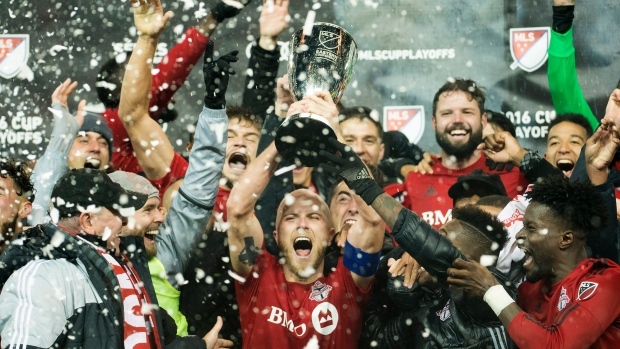 In its 10th season, Toronto FC is one game away from celebrating the MLS championship. There have been times in this franchise's checkered history where that seemed a pipe-dream. Prior to 2014, Toronto scored double-digit wins in a season just once in seven years. The front office was expert mostly in rolling back ticket prices to try to retain once-loyal fans. There was a revolving door policy to players, coaches and philosophy. But Wednesday night wiped out much of that misery. Greg Vanney's team got to the championship game against Seattle in a where's-the-Gravol, roller-coaster ride of an Eastern Conference final against the Montreal Impact. Substitutes Benoit Cheyrou and Tosaint Ricketts scored two minutes apart in extra time to send Toronto to the MLS Cup final with a 5-2 win on the night and a wild 7-5 aggregate victory over the Impact. "One of our messages was there was no way, no chance, no how we were going to be outcompeted tonight in front of our fans in our stadium," said Vanney. "And we were going to run hard and we were going to run through everything that we had to make sure that those margins turned in our favour." It took extra time and 12 goals to decide a scintillating series. Toronto will host the Sounders on Dec. 10 in the MLS championship game, becoming the first Canadian team to go for the title. "For me, the most exciting playoff event that I've ever been a part of," said Vanney. "And for sure that I've ever seen." "Tonight was a special night," said captain Michael Bradley. "Ten days from now we want to do one better." Toronto trailed 3-2 after Game 1 in Montreal and had to come back the hard way after the Impact scored first. And when Toronto responded, Montreal came back in a heavyweight battle played out in the rain before a BMO Field record crowd of 36,000. Only once before in MLS playoff history had a club trailed by as many as three goals in a two-leg aggregate series and come back to win the tie. The San Jose Earthquakes were down 4-0 in 2003 before rallying to defeat the Los Angeles Galaxy 5-4. Tied 5-5 on aggregate, Cheyrou scored on a header in the 98th minute, just one minute after entering the game, when he knocked in a Steven Beitashour cross. Then Jozy Altidore outmuscled a couple of defenders to send in a cross that Ricketts, beating two more defenders to the ball, swept in. The Toronto FC faithful, who had been rained on most of the night, started chanting "This is our house." The Toronto bench came flying onto the field after the final whistle to celebrate the historic win as confetti flew from the rafters. The players then went to celebrate in front of the south stand fans before the Eastern Conference cup presentation. The Montreal players were spent. "Guys are down in the dressing room. It's gruelling out there," said Impact coach Mauro Biello. "Today was a tough game, a lot of emotions in playoffs, it's a long season, and in the end the players gave everything, all the way to the end. It's a tough moment, for sure, for everyone, when you're so close and falling short. But we'll be back, and we'll be even stronger." In the Toronto dressing room, hip-hop blared. Canadian midfielder Jonathan Osorio clutched the Eastern Conference cup like it was his newborn baby. "A lot is going through my mind," he said. "I'm just trying to live in the moment, try to enjoy it. But at the same time I'm already thinking about the final. I'm already thinking about how we can beat Seattle." Dominic Oduro opened the scoring in the 24th minute for Montreal, a goal that meant Toronto had to score twice. Armando Cooper and Altidore did just that before the first half was over, tying the aggregate score at 4-4 with an away-goals edge to Toronto. But Impact danger-man Ignacio Piatti made it 2-2 — and 5-4 on aggregate — in the 53rd minute after substitute Johan Venegas found him behind the defence. The ball bounced off either Piatti or defender Nick Hagglund, leaving Toronto fans to watch in pain as it trickled slowly into the net. Hagglund restored order with a superb header in the 68th minute to make it 3-2 on the night and 5-5 on aggregate. It came off a short corner with Justin Morrow delivering the cross. Ricketts had two late chances but tried to pass instead of shooting. Then his shot was blocked after a wonderful buildup by Sebastian Giovinco. Evan Bush then stopped Altidore at close range. Giovinco limped off the field seven minutes into extra time after injuring his right leg taking a shot. Vanney said after the game it was just a cramp. The opening leg of the conference final was really two games in one. Montreal led 2-0 after 12 minutes and 3-0 after 53 minutes. But two valuable away goals in the 68th and 73rd minutes gave Toronto reason to hope. For Montreal, the win felt like a loss. Still it marked only the third time that Toronto had tasted defeat since mid-July (11-3-5). The lone lineup change Wednesday was Will Johnson in for Osorio in the Toronto midfield with Vanney sacrificing Osorio's offensive skills for Johnson's tenacity and bite. It was a physical contest, an evening when "you err on the side of aggression," said Bradley. Midfielder Hernan Bernadello got the worst of a nasty collision with Altidore as they went for an aerial ball in the 13th minute. Altidore's shoulder caught the Impact player high and Bernadello's head was driven in the turf as he toppled. A dazed Bernadello eventually got up and continued to play after treatment, but was removed at halftime. The opening Montreal goal came immediately after a fine scoring chance by Toronto. A sublime Bradley pass found Morrow in the box but the fullback elected to try to find Altidore rather than shoot himself. The Impact then struck on the counter-attack with Patrice Bernier nicking the ball off Bradley. He sent the ball to Matteo Mancoso, whose pass sliced open the Toronto defence to find Oduro. The former TFC player made no mistake, beating Irwin with a low shot in the 24th minute. Oduro also opened the scoring in the first leg. Cooper tied it up in the 37th minute off a Giovinco corner. A header from a flying Hagglund was blocked by Bernadello on the goal-line but the ball bounced straight back to Cooper who banged it past Bush. Another Giovinco corner led to a 45th-minute goal with Altidore beating a defender at the front post to flick the ball past Bush. The U.S. international then raced around the corner flag and headed to the Toronto bench to celebrate. After Piatti's goal, Toronto brought on offence in the form of Ricketts for Johnson in the 62nd minute. Both legs of the conference final featured record attendances. The Nov. 22 opener at Olympic Stadium drew 61,004, tying the Impact record. Wednesday's paid attendance of 36,000 was also a record for BMO Field, which was filled with 33,421 for Sunday's Grey Cup. The soccer configuration for the stadium allows more seating. Toronto's record crowd is 47,658 for the CONCACAF Champions League quarter-final against David Beckham and the Los Angeles Galaxy in March 2012 at Rogers Centre.